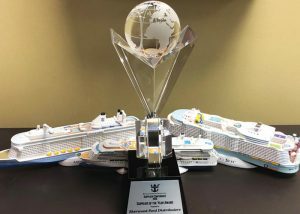 Sherwood Food Distributors has been named Supplier Of The Year by Royal Caribbean Cruise Lines LTD.
Sherwood was honored with the award at Royal Caribbean’s Supplier Conference 2018. This is the third win for Sherwood Food Distributors at the conference which is held every four years. Sherwood’s previous awards were in 2010 and 2014. Sherwood would like to acknowledge the tremendous efforts of Gene Kliger, and the entire Cruise Line team at Sherwood’s Miami Division on a job well done!